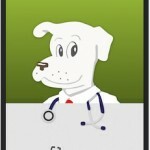 The Doggy Doc app puts the power of a veterinarian at your finger tips. The app is the world’s first artificial veterinary intelligence for dogs that was developed with veterinarians. The app can help you derermine your dog’s illness by delivering easy, personalized descriptions of symptoms and explantions of treatment. If you should have any major concerns about your pet, please make sure to visit your veterinarian. The cost of the app is $2.99 and it can be downloaded from the App Store and Google Play.